Maj Gen C S Bewli is a graduate mechanical engineer and has post graduate diplomas in Geographic Information Systems from The Netherlands and in Computer Applications from R C C, Chandigarh. As a scientist, he’s been to Antarctica with the Indian Scientific Expedition and he is one of the pioneers in mapping the virgin territory of the continent. 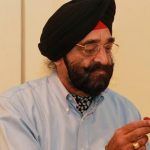 He is the founder President of Bonsai Culture Society, Chandigarh and he is one of the foremost figures in generating bonsai awareness in the region by holding solo exhibitions and conducting classes through lectures coupled with demonstrations. As a columnist with national daily The Tribune, one of the leading dailies of North India, he wields his pen about articles on bonsai, cacti and other gardening disciplines. He is also the President of National Cactus & Succulent Society of India for the past over a decade and has authored the book titled ‘Cacti Culture’. He currently resides with his wife at Chandigarh.